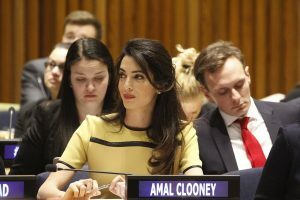 St Hugh’s College offers its congratulations to human rights lawyer and alumna Amal Clooney (Law, 1996) on being named the Global Citizen of the Year. The honour was bestowed by the United Nations Correspondents Association (UNCA), which was celebrating its 70th anniversary. Her speech accepting the award made headlines around the world, including in the Telegraph, Evening Standard, USA Today, and Huffington Post. The ceremony featured guest of honour António Guterres, Secretary-General of the United Nations.